Life continues to just plug along speed by at a rapid rate. School has started again. I have a Senior and a Freshman this year. Hard to believe that both my boys are in high school. My freshman started working on classes at the end of July, but my Senior started this Tuesday. I continue to work my vintage resale business as much as I can. This Sunday I saw there was an estate sale in town. Those don’t happen too often. Many times people call a garage sale an estate sale, but true, sell everything because a family member passed away, sale doesn’t happen too often. I decided to enjoy my Sunday afternoon by going to the sale. I saw three cast iron tulip bouquets for sale for $2 each. I wasn’t sure about them, so I left them. When I got home I did research and found they were doorstops, but some people use them as bookends. There were a couple of individual ones for sale on Etsy. So on Monday, when my son and I were doing errands to get him ready for the two classes he is taking at the high school, we drove nearby the same sale. We stopped, and I bought two of them for a set. I listed the set in my Etsy shop late on Wednesday afternoon and by midnight they were sold. Now THAT doesn’t happen very often, but I love it when it does. 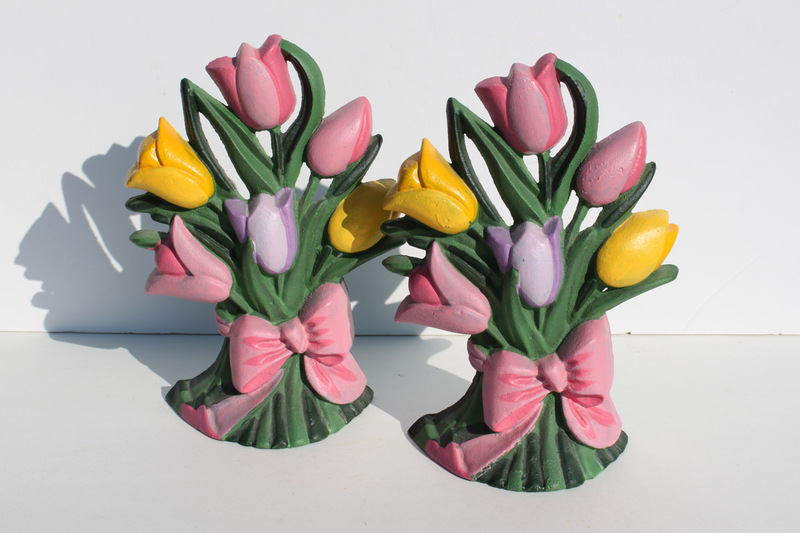 This entry was posted in It's Still Life Shop, Junkin' Pickin' Finds and tagged doorstop, tulip by Karen Grosz. Bookmark the permalink.